Interview with Leena Alam: "After the slap, when I went up the stairs, I hid under the dining table in a room"
Leena Alam is an award winning Afghan film and Tv actress and a Human rights activist. She started her acting career in 1998 with films as “In a Foreign Land”, “Loori” and a few more made by the Afghan diaspora filmmakers in the US. She made her debut in Afghanistan in Barmak Akram’s 2008 “Kabuli Kid”, and went on to do “Soil and Cora”l, “Ahwal e Darya”, “A Letter to the President” and a few short films to help young rising film makers in Afghanistan. She is mostly known to have worked in subjects that speaks on Child Marriage, Gender Equality, Women’s Right and Social Conflicts. Her notable work on these subjects are “Shereen” The struggle of a powerful woman, a taboo-smashing feminist TV drama, and “The Killing of Farkhunda” a re-enactment of the killing of a 27-year-old Afghan woman falsely accused of burning a copy of the Quran. On the occasion of “A Letter to the President” at Vesoul International Film Festival of Asian cinema, we speak with her about the film, women, cinema, and the general situation in Afghanistan, and many other topics. As we all know, the Taliban fearlessly destroyed everything in the country. Schools, historic monuments, buildings, cinema halls…. and among all, they raided the Afghan Film Organization destroying film reels, burning and breaking television sets, film and music cassettes. They were the enemy of art, culture, education and they were the enemy of women. Especially the ones who didn’t follow their rules, women who wanted to take part in art, culture, education, cinema, to work freely in a society without wearing a Burqa or head scarf. 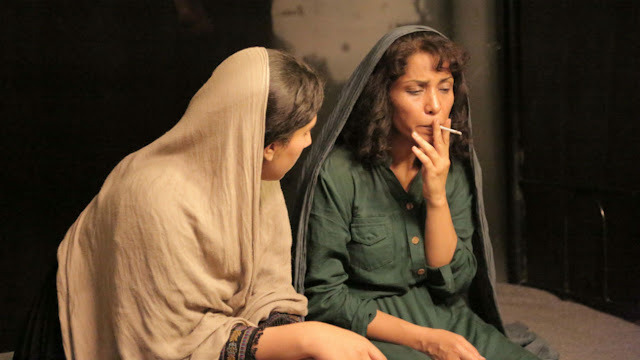 After my experiences during my visit to Afghanistan I decided that acting was what I wanted to do and be the voice and tell the stories of Afghan women trough the characters I would play. I think it is very important in today’s societies for people to raise their voices against suppression, brutalities and injustice. Especially all artists, journalists, media. They have the most peaceful and harmless weapon, which is their voices trough their work. Together, they can be the loudest and most affective in bringing changes. Why did you decide to take the role of Soraya in “A Letter to the President?” In general, what are the criteria for you to pick a part in a movie? I normally choose a role that has something to say, that has depth. In films that are realistic, that people can relate to and feel close to its content and characters. I love to do roles that challenge the conservative societies. Talk about subjects that are taboo and are to be questioned. In “Letter to the President” Soraya did exactly what I do through the characters I play. She challenged, regardless of the consequences. Well, after she introduced me to Soraya, I did a little research of my own in understanding Soraya. I read and watched some documentaries on women similar to Soraya’s position. As a woman living in that society for so long I felt her in every way, it was not hard adapting her character. Well, to make long story short, the slap was shocking even behind the scene as it is in the scene. Initially my co-actor had objected the scene. After being convinced, he agreed to it only if my hand didn’t touch his face. Meaning, he did not want to be hit in real. After a few takes, it was clear that the scene did not look realistic. It was then decided that the next take would be a real slap, without him knowing about it. After the slap, when I went up the stairs, I hid under the dining table in a room. He came twice looking for me as I could see his feet from under the table. I didn’t want to face him not knowing how he would react, I stayed there for 10 to 15 minutes until Khalid Drudgar (sound man) and Nazeif Behnam (still photographer) on the set, came looking for me. They told me that I don’t need to be afraid and assured me that they won’t let anything happen to me. Even though I have not seen the film yet, I think the it was to have an open ending. It is for the audience to imagine and have their own interpretation. Remember, Afghanistan is one of the most corrupt countries in the world. Soraya or Sorayas are the least concern of the government which is surrounded and occupied by warlords. President vs warlords, it is not going to be easy rescuing Soraya. Messages to President get lost on the way, unless you know someone who is really close to him that could hand deliver it personally. Regarding the actresses, the main concern is the security. After Dr. Najib’s government, people have lived under Mujahideen and Taliban’s regime. Naturally, their extremism mentality still exists in people, which makes it even harder for actresses. We are talking about a conservative society that does not allow women to show their face to non Mahram. And here we have actresses working so closely with men in scenes and they are seen by millions of people. During the filming of “Shereen” Tv drama, Mullah had issued Fatwa against the character I was playing and the drama. Soon we were attacked with hand grenades in Kabul. Again shooting for the same show, we were attacked by a man breaking props and the set threatening to kill us if we didn’t leave the location in Shamali. During filming of “Qamar”, my short film, we were threatened to be killed. I didn’t know what to do knowing that I may be putting 17 peoples lives at risk including mine. Accompanied by so many male actors, exposed and occasionally touched, you can imagine how much negativity and threatening messages I received after playing Farkhunda on the street. But that hasn’t stopped me and other artists from doing what we love. I am sure some of your readers have read or heard about the suicide attack during a play on the Institut français d’Afghanistan in Kabul. The full story can be seen in “True Warriors” a film by Ronja von Wurmb-Seibel and Niklas Schenck. Even now, four years later, a sound of a toy balloon bursting scares me. Sean Penn, Viola Davis, Meryl Streep, Jodie foster, Helen Mirren, Daniel Day-Lewis, Nawazuddin Siddiqui, Manoj Bajpayee, Tom Hanks, Philip Seymour Hoffman, Sally Hawkins, Forest Whitaker, John Malkovich….